Spring is a good time to bake cakes in the shapes of animals, such as bunnies, chickens and lambs. If you were lucky enough to have purchased a lamb cake mold from the former Martha by Mail catalog, then you are well aware of the versatility of such a shape. Perhaps you want to have one for your Easter gathering or for a spiring birthday. 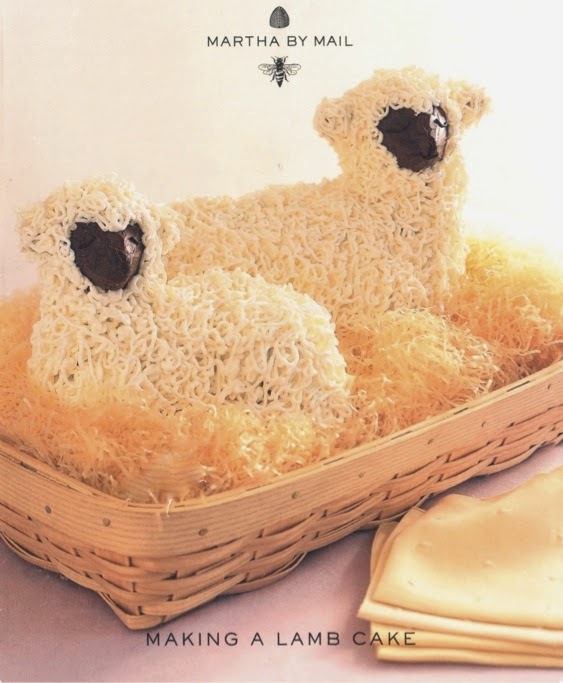 The lamb could also be baked for a baby shower or christening this season, which will display nicely on a cake stand or platter of your choice. As you can see from the decorating card, there was a small lamb and a large lamb cake mold available at one time from Martha by Mail. These heavy, cast-aluminum molds were not exclusive to the catalog. In fact, these can still be purchased from one of my favorite purveyors of kitchenwares, Fante's in Philadelphia. For the large lamb mold, click here. For the smaller lamb cake mold, click here. If you want to make the cakes, per the Martha by Mail recipes, follow along. Use the ingredient amounts in the left column for a small lamb mold, and the ingredients in the right-hand column for a large lamb mold. Bake the cake face down. Batter may leak out during baking; place the batter filled mold on a parchment-lined baking pan. 5. Pour all batter into handled half of mold; tap it firmly on a counter to remove bubbles. Set rear half on top, and place mold face-down on a parchment-lined baking pan. 6. Bake small cake 30 minutes and large cake 40 minutes. Remove mold from oven, and carefully invert it on baking pan. Continue baking small cake for 30 minutes and large cake 40 minutes, until cake has browned nicely (run a paring knife around the edges of mold to separate, then check underneath the top) and a cake tester inserted in the cake comes out clean. Gently remove top half of mold, and set bottom half of mold with cake inside a wire rack to cool for 10 minutes. Carefully turn out cake, supporting it with your hand. Stand cake right side up, and transfer to a wire rack to cool completely. When cool, wrap cake in plastic, and chill until ready to use. You will need: Orange Pound Cake baked in a lamb mold; a cake round (available at baking supply stores) or a piece of clean cardboard; Swiss Meringue Buttercream; brown gel past food coloring; one 8" and one 12" pastry back with couplers; #2 and #3 round tips; two 11x16" pieces of waxed paper; a pastry brush; a small offset spatula; and a serrated knife. 1. With a serrated knife, trim the bottom of the chilled cake so that it stands upright. Using a small amount of icing, adhere the cake to a cardboard base of the same size. 2. Place 1/4 cup icing in each of two medium bowls. Using food coloring, make one bowl of icing medium brown, and the other bowl dark brown. Fill the 8" pastry bag, fitted with a #2 tip, with the dark brown icing. Fill the 12" bag, fitted with the #3 tip, with white icing. 3. Set the waxed paper on a serving platter; overlap the pieces by 1/2". Place the cake over the intersection. Using a small offset spatula, cover the cake and the cardboard base with a thin layer of white icing; leave the face bare. Following the outline left by the mold, use the small offset spatula and the medium brown icing to cover the face of the lamb. Chill cake until icing is firm, about 30 minutes. 4. Remove from refrigerator. Working from the base, follow the contours of the cake and pipe white icing so it falls in curls to create the lamb's "wool". Smooth icing on the face with the offset spatula, then pipe the eyes and mouth with the dark brown icing. 5. Chill cake until icing is firm, about 30 minutes to 1 hour. Carefully remove the waxed paper. Slice the cake from the tail forward and serve. They are stunning - way out of my capability league though....so I will just enjoy looking at yours. I must admit, Phil, that I'm tempted to get baking after this post. I've tried that orange pound cake recipe before, when I made the chicken cake, and I can tell you that it's pretty good.